For pico de gallo: In a medium bowl, combine onion, tomato, cilantro and jalapeño. Add the lime juice and season to taste with salt. Set aside. In a large skillet, heat 2 cups vegetable oil to 375°. Fry tortillas for 1 minute per side or until golden brown. Drain tostada shells on paper towels. In a large skillet, heat 1 tablespoon vegetable oil over medium-high heat. Sauté tip steak until brown and cooked through. Season to taste with salt and pepper. Meanwhile, heat the refried beans in the microwave or on the stove. 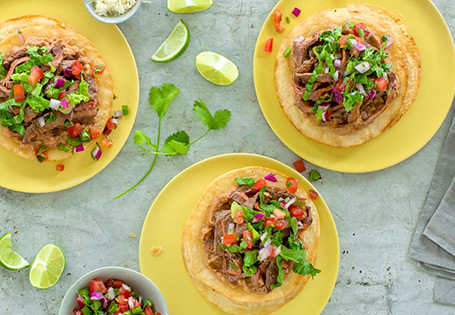 To assemble: Spread each tostada with refried beans. Top with shredded cheese, steak, pico de gallo and shredded lettuce.